Some key reforms are needed to better cope with troubled borrowers. For the past year, analysts have noted that China’s debt has been steadily mounting. Currently, the debt to GDP ratio sits at about 250 percent. Much of the growth in debt originated from climbing local government debt, undertaken in order to build up infrastructure, as well as from increasing corporate debt, stemming in large part from the real estate sector. What are some potential resolutions to China’s debt woes? Local governments appear to have some resolution in sight, as they can now roll over their debt into municipal bonds. Although this does not address structural issues that would rule out the incursion of new debt going forward, it does provide significant relief to local governments that participate in the program. Many local governments, via their associated financing vehicles, have taken on new debt just to repay existing debts, and are therefore in dire need of a legitimate way in which to roll over their existing loans. However, the municipal bond program may do little more than temporarily stave off a bailout. Since local banks and other state owned enterprises often end up purchasing the debt, this may simply shuffle bad debt from one balance sheet to another. In the case of potential default, the bad debt may be purchased by a local asset management company, another state owned entity, essentially providing a bailout for the bad debt in the long run. While local governments are effectively kicking the can down the road, corporations may face more binding liquidity and solvency issues. Since many of the indebted corporations are in real estate, and the price of property is declining across China, some of these indebted developers are in dire straits. 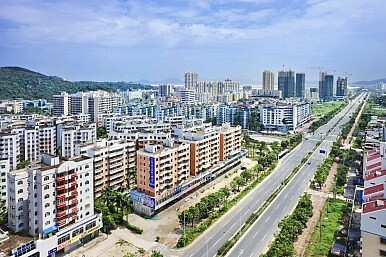 Although Zhejiang Xingrun Real Estate Co is the only developer to have collapsed, other real estate firms have found themselves in desperate search of new funding. Some have turned to the practice of issuing perpetual bonds, which pay out high interest rates and have no maturity date. The bonds are classified as equity or equity and debt, depending on how they are structured. Citi Research Estimates find that if reclassified as debt, the perpetual bonds would sharply increase leverage among their property developer issuers, up to 248 percent for the large Evergrande Real Estate Group. A riskier venture was exposed last month in Handan, Hebei Province, involving 32 property firms that had illegally raised 9.3 billion RMB ($1.5 billion). The scandal was exposed after property developer Handan Golden Century Real Estate found itself unable to repay its debts. Developers had attracted private investors through promotions and high interest rates as they found themselves increasingly unable to obtain bank loans. Because of the downturn in the real estate market and the use of creative financing, property developer finances are now being closely monitored by the China Banking Regulatory Commission. Smaller real estate developers in particular face more funding pressures than larger developers, which may be able to obtain equity funding or foreign capital. At this point, it seems inevitable that some smaller property developers will collapse, but it is also likely that some developers will receive a bailout. Those who obtained trust loans and cannot repay them, for example, may find their funds paid by the local government or another entity, if history is any guide. Other developers may turn to the informal financial market of family, friends, and private money lenders to roll over their debt. Unfortunately, these resolutions to China’s debt woes are second-best. A better alternative would be to improve the bankruptcy process and allow companies to declare bankruptcy so that debt and assets can be dealt with efficiently. Even in the case of collapsed firm Zhejiang Xingrun Real Estate Co, local officials skirted the stigma of bankruptcy by dealing with winding down debt and assets themselves, rather than going through a more streamlined bankruptcy process. In cases where firms only face liquidity, rather than solvency, issues, the provision of short-term emergency loans (not bailouts) to less risky firms with conditionality may prevent liquidity issues from becoming more serious. Although China’s debt debacle has not yet caused a financial crisis, its coping mechanisms are less than ideal. Future reforms should remove government accountability for financial and non-financial firm failures and enhance the options facing troubled firms. These reforms are not a given, and are important changes to make as China’s economy becomes more market-oriented. China’s government is cracking down on local level debt, and this may dampen GDP growth in the second half of 2017.